Web Parts are back at the center of SharePoint development! Today at The Future of SharePoint event Microsoft have announced the next iteration in SharePoint development - the SharePoint Framework. As one of the old ones who started with the Digital Dashboard Resource Kit, to the COM+ event handlers in SharePoint 2001, over to custom built DDFs, to WSP's to Apps and Add-ins - this new framework is a very welcome change. For years SharePoint Developers have been forced to walk in shame in the outer rims of the developer guild. It's been so hard to get over the threshold and once you were over it, there was very few who actually returned to a normal life. I've been struggling for years to get ASP.NET or web developers to get on over to SharePoint development with no luck. The Add-in model did not help in any sense here and just introduced new pitfalls and confusions. Last year at the MVP summit we were introduced by Jeff Teper (I'm so glad that he's back on the team) that they had some cool things cooking in Redmond. He, and the team, told us that they were here for the long run and that they were building something new that would supersede the current existing extensibility model. And in February this year I went over to Redmond to try this out with my own set of hands at an event called the DevKitchen. This event where we all were introduced to this new model is one of my top moments in my Microsoft developer career and the interaction we had with the engineers was just phenomenal, looking forward to the next one Dave! I do believe that our trial and errors and feedback made the end result so much better. What we got our hands at that DevKitchen was the new extensibility model, now called the SharePoint Framework. In my opinion this is an evolution of SharePoint, adapting to a more modern way of building applications. It's not replacing Add-ins, and they are not replacing WSP's and server side code. It's another tool in our toolbox - albeit it might be the one I will use first hand from now on. This new SharePoint Framework consists of a couple of different parts. You can read more about it in Bill Baers post - The SharePoint framework - an open connected platform. The one thing that excites me the most about this new SharePoint Framework is that Web Parts are back, with a bang! Web Parts was what brought me into SharePoint. In the previous millennium we built our Web Parts using VBScript and was pure client side code, until they appeared in SharePoint as a server side component, and then adopted in ASP.NET as a standard feature. Unfortunately Web Parts has had some very dark times, and that was when the Apps/Add-ins entered the scene and introduced App Parts - an abomination. Well, let's forget the past and look at the new client-side Web Parts. Web Parts are back as a client side thing. Client-side Web Parts are now built in (preferably and initially) in TypeScript. They are very similar in construct as you know Web Parts; they can be initialized, persisted, have properties and of course a way of rendering them. These new client-side Web Parts will live side by side with the old and traditional Web Parts. Fun fact is that I think I was the one, external from Microsoft, that actually built a client-side Web Part that worked. Using client-side technologies isn't something new, the only new thing here is that we now have a proper and supported framework for it. Client-side technologies isn't perfect either, with access to the DOM we are given great powers, but we do this all the time today. The SharePoint Framework is all built on open technologies and you can use whatever platform you prefer. The initial release of the SharePoint Framework will be built for TypeScript, node.js Yeoman and npm. These are four technologies that you should read up on before the SharePoint Framework is starting to roll out this summer. All you need to build you solution is then an command prompt and Visual Studio Code. Just to give you an example on how these client-side Web Part works and so that you can see how similar they are to the Web Parts we are used to build, here's how you would create a simple client-side web part. Disclaimer: things below here can most certainly change until GA of the SharePoint Framework. To prepare your environment you need to install node.js and npm and the Yeoman generator, which will take care of the project scaffolding for you. Then you download the specific SharePoint generator using Yeoman and start the scaffolding (exact command to be determined; hopefully yo sharepoint). This interface is used to define the properties of your Web Part, in this case only a description property of the type text. In the generated file there are by default three overridden; the constructor, the render method and a property called propertyPaneSettings. For this post, let's just focus on the rendering of the Web Part. This method is responsible for rendering the client-side Web Part, and in order to do that we have access to the actual DOM element, through the this.domElement object. WIth that we can manipulate the DOM as we will and in this case just insert HTML directly into the element. We can also in this method setup any bootstrapping we want for our favorite framework, we can check the mode to see if we're in edit mode or not, and we can get properties using the data argument. Once we're done building our client-side Web Part we of course would like to take it for a test ride. And now over to something really cool. Remember building Web Parts and you need either your own virtual machine or an Office 365 subscription with internet connection. No more! You can sit on an airplane (like I do now) and just run the gulp task called serve. This task will wire everything up, start your browser and open up the Workbench, which is a local offline canvas for the new page model and you can work with your client-side Web Part. If you need any changes to it, just modify the TypeScript file and the task will take care of compilation and reload your browser. Can't be easier. Of course this method has no access to SharePoint data or the Graph, so you need to work with mock data - which generally is a good idea anyway!! Then when you're ready to go test with live data you can use the Workbench that will be present in SharePoint (not available until later this summer I'm told) and there's also gulp tasks for packaging it properly so that you can either upload and host your client-side Web Part script files in either a CDN or in SharePoint itself. I think this is more or less exactly what I've been longing for in this area. SharePoint team - you nailed it! Make sure to check in this video by Daniel Kogan in which he walks through the new framework, page model and how to to build a client-side web part. There's also a concept called client-side applications. This is the new way of customizing lists and libraries. In a nutshell you register a client-side application for a list or a library and then you are solely responsible for rendering the user interface, in a similar fashion as above. Can't wait to see what awesome stuff people builds with this. But, that's for someone else to write about, or me at another time. How do you feel about this? I think this is a fresh re-start of the SharePoint oil tanker and I welcome all the new thinking in this space. Yes we have to re-learn quite a lot of stuff, but I love that. And honestly people, SharePoint developers has been the laziest group of developers out there (except some Cobol veterans) and been very afraid of changes (remember when all people screamed for their life when the App model came?). Get out of your comfort zone, learn new stuff, build cool stuff and enjoy SharePoint land once again. SharePoint is back and Web Parts are back! Up until now SharePoint (out-of-the-box) has not been that efficient on this, even though SharePoint 2010 did some improvements. Most often the whole page has been reloaded for each and every action, this of course affects all end-users and the perceived performance of SharePoint. But now, with SharePoint 2013, we have a whole new paradigm thanks to the Minimal Download Strategy - MDS. In this post I will walk you through some details of MDS, how to leverage it in your own customizations and how to successfully adapt your current and future customizations to MDS. Note: article has been updated per 2012-08-16 with some more nice details..
Let's dig one step further down and see what really happens and detail out some of the moving parts. [Edited 2012-08-16] First of all what sites do have the MDS enabled by default? MDS is actually a SharePoint feature (Name; MDSFeature, Id: 87294C72-F260-42f3-A41B-981A2FFCE37A) which is Web scoped. Some of SharePoint 2013 Site Templates has this feature stapled (for instance Team, Community, Wiki, Projects, App and Blog sites). The feature is very straightforward - it toggles the EnableMinimalDownload property of the SPWeb object. So you can quite easily yourself turn it off using code (server side or CSOM!!) or PowerShell. Of course you also use the Site Settings > Site Features to turn it on or off as well. Except enabling MDS it is required for the MDS to work there is one control that must be placed in the master page - the AjaxDelta control. It should be added to the head section of the master page. This control is responsible for a couple of things. If the page is a start/home page it will clear all controls and make sure that the page is loaded fully and registers the correct scripts. How is the delta pages generated? 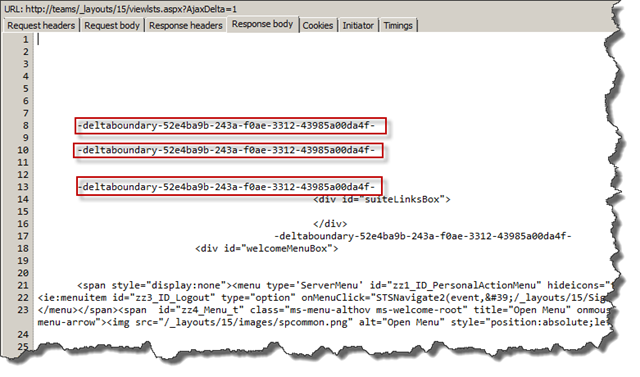 One of the key things in the MDS implementation is that SharePoint 2013 contains a new Page class - the DeltaPage. This page class is the key to generating the full pages or just the deltas. Fortunately the common pages such as WebPartPage, WikiEditPage, UnsecuredLayoutsPageBase, LayoutsPageBase etc are inheriting from this page. so most of the out-of-the box pages works and hopefully your custom application pages as well. This page class is quite smart it can handle when MDS is not enabled (ie default rendering) and when MDS is enabled. When MDS is enabled for the site this page is responsible for creating the delta response. The DeltaPage is also responsible for handling exceptions such as when the master page is different (another one or a new version). 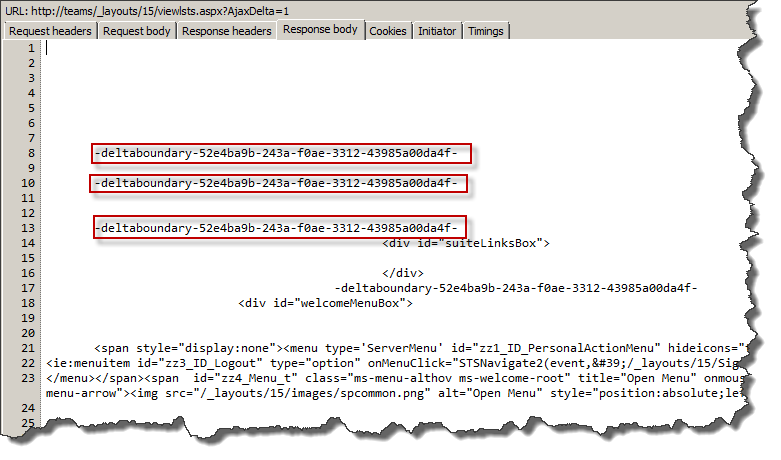 Every delta request sent using the asyncDeltaManager has a specific request header - the X-SharePoint header. This header contains information about the master page, the language and if the page is in read-write or read-only mode. [Added 2012-08-16] This header is important since it contains the master page, the version of the master page etc and SharePoint uses this to determine weather to do a full reload (if the master page have changed) or not. So if you’re working on a master page, be prepared for full reloads of the page, at least the first time you request a page using the modified master page. [Added 2012-08-16] There is one control called PageRenderMode that can be used on a master page, web part page or page layout. This control has one property called RenderModeType which can have one of two possible values; Standard or MinimalDownload. If the control is placed on a page and have the property set to Standard – it will prohibit the page from being rendered using MDS. If the control is not present or if it’s property is set to MinimalDownload it can participate in MDS rendering. So this control can be used on specific (master)pages to prohibit MDS. A word of caution here, if you’re using the Design Manager to generate master pages, this control will automatically be inserted into the generated artifacts. Another gotcha here is that even if you have the PageRenderMode control set to MinimalDownload whenever the publishing features are enabled and you have the ribbon on the page, specifically when using the PublishingRibbon in your master page, SharePoint will automagically inject, during runtime, the PageRenderMode control with the property set to Standard. How does the delta response look like? The Guid is unique (which is the purpose of guids :-) and the asyncDeltaManager retrieves the current token from the response header called deltaBoundary. This image shows a snippet from the IE Network monitor. After all deltas, at the end of the response, is another encoded set of data. The asyncDeltaManager takes all this information and assembles the page, so it all looks fast and neat for the end users. If you upgrade a SharePoint 2010 site with custom Web Parts or controls, you will soon realize that the upgraded Webs are not rendered using MDS - even if you update the EnableMinimalDownload property on the SPWeb object. This is due to the reason that the DeltaPage checks all controls present on the page for a specific attribute - the MdsCompliantAttribute. This is an attribute that you can set on a class or on an assembly. If any of the controls present on a page does not have this attribute or has the IsCompliant property set to false it will not render any delta for that page. Or, you could add the MdsCompliant to the assembly instead of to each class. [Added 2012-08-16] The MdsCompliant attribute is set on the whole Microsoft.SharePoint.dll assembly, but not on the Microsoft.SharePoint.Publishing.dll assembly. This is a bummer. This means that all the Field Controls, used in page layouts, are not MDS compliant – which means no MDS on publishing sites. An important thing here to remember is that the MdsCompliant attribute does not work in the Sandbox!!! So adding a Sandboxed Web Part to a page disables MDS for that page, period. Whew, quite a long introduction to the Minimal Download Strategy. I hope that you have a better understanding of it by now and that you better know how to possibly troubleshoot any issues with it (or rather your customizations on MDS sites). There are more to discuss on this topic though, but we'll save that for another day. Cheers! This episode was recorded at the MVP Summit earlier this year in Redmond between two sessions. It was my first time meeting most of the MVP's in real life and Rob was the one interviewing me. He's one heck of an interviewer asking questions like an ice-hockey radio commentator in some weird southern accent... It was great fun and we discussed SharePoint development and Web Parts development in particular. We talked through how to get started with SharePoint development, how to build Web Parts and why I wrote my book (SharePoint 2010 Web Parts in Action). Here goes another post using the WebPartAdderExtension Element. I previously wrote an introduction to custom Web Part Gallery sources and a second one on how to enhance the end-user experience when adding new Web Parts. Now I'm going to show you another trick that this technique can be used for. Deploying Web Parts are normally done by using the Module element in the Elements manifest and using that element uploading/deploying Web Part Controls Description files (.webpart or .dwp files) into the Web Part catalog. These Element manifests for Web Parts must be scoped to the Site Collection level, since it is there where the Web Part catalog lives (~/site/_catalogs/wp). So if you want do deploy a solution containing a set of Web Parts you need to activate that Feature on each and every Site Collection. You can do it in a number of ways such as Feature Stapling, code, scripting etc. Could be quite tedious work if you have a large farm with many site collections and web applications. Also when retracting solutions with Features that uses Modules we manually have to clean up the files provisioned. Did you see that! Using this simple technique you can easily deploy and maintain Web Parts for a specific Web Application or the whole Farm if you like! Just follow the previous two guides and change the Scope of your Feature and you're ready to go. There is one caveat with this though. If you set your Feature to Farm and deploy the solution, but only deploy/install it to one ore more Web Applications. The Safe Controls will only be installed on those specific Web Applications - not on all Web Applications in the farm. But the custom Gallery Source is still visible in the whole farm. This results in that you will get Safe Control errors as soon as you add the Web Part to a page in an Web Application where the Solution is not deployed. This was the third really cool thing about the Web Part Adder and it's friends. It's never been this easy deploying Web Parts in SharePoint 2010. There are still a few more parts to be disclosed about this little nugget! If you have been working with SharePoint as an end-user you've probably seen the nice modal dialog that pops up when you're adding a Silverlight Web Part to a page, see the image to the right. It allows you to very easily configure the Web Part with the appropriate XAP file without editing the Web Part properties. If more Web Parts were like this it would be a whole lot easier working with Web Parts. The good news is that you can do this for your Web Parts - using a custom Gallery Source, just as I showed yesterday. And I'll show you how. First of all create a new empty SharePoint project in Visual Studio. Then add an Empty Element SPI, we'll skip adding a Web Part like yesterdays post showed. In this Empty Element SPI add three files; one for the Web Part, one for the Gallery Source and one for the Gallery Item. Make sure to change the Scope of the automatically added Feature to Site Collection, instead of the default Web value! You also need to add the SafeControl entry for this Web Part on the SPI. Right-click the SPI and choose Properties. Click the ellipsis button on the Safe Controls row and click Add to add the Safe Control. Click OK when you're done. This property could basically contain anything, as long as it can be represented as a string. You can create JSON structures for instance if you need to pass more advanced data structures to your Web Part if you perhaps like to set several properties. It's just closing the Dialog with an OK value (1) and then passing the value of the textbox as second argument. Now when you click Add you should, instead of seeing the Web Part on the page, see a Modal Dialog popping up. If you close the dialog without clicking the button your Web Part is not added, but if you write something in the text box and click the button the Web Part should be added to the page with the custom property set as specified in the dialog. Once again the WebPartAdder has proven to be very useful for end-user scenarios where you want to make it easier for users to add and configure Web Parts. Not only can we dynamically populate the Web Part Gallery, we can also force users to specify configuration/information for the Web Parts. Happy devving! Writing this post has been on my agenda for some time, initially I intended to put it into my SharePoint 2010 Web Parts in Action book, but there was not enough time, you know how it is! This is an excellent new feature to SharePoint 2010 which allows you to dynamically populate the Web Part Gallery with Categories and Web Parts. So here we go. Think of the List and Libraries category in the Web Part Gallery - it is dynamically populated with the lists and libraries available in the current web. This is all done using the WebPartAdder class which loads all the Web Parts available in the gallery from a number of different sources, see figure below. These source include the List and Libraries category, the local Web Part catalog, files in the wpcatalog, closed and uploaded Web Parts etc. The really cool thing with this is that you can actually create custom Gallery Sources! This is a new feature of SharePoint 2010 and is really simple to do. I'll show you how! I've not yet seen any guide on how to create a custom Web Part Gallery Source, even though the classes and methods in MSDN are documented (the MSFT minimalistic way). To get this all working you need to use a new Feature element available in the Element manifest called WebPartAdderExtension. This element is referenced only once in MSDN, where it only says that the element is not documented! In this walkthrough I will use a very simple custom gallery source. It will dynamically populate the gallery with Product Web Parts that displays information about products. The product information is stored within a SharePoint list, in the local site, called Products. From this list we'll create a new category in the gallery that lists all products, and when a product is added to the page it should add a new Web Part displaying that particular product information. Start by creating a new Empty SharePoint project. Make it a farm solution. Then add a new Web Part SPI - this will also add a Site Collection scoped feature to your project. In the Web Part SPI remove the .webpart file. We do not want to add this Web Part to the gallery - we only need the Web Part class. You can of course make the Web Part without an SPI if you want to. Next step is to build the Web Part user interface - and here you can get fancy if you like. If you feel for a copy and paste excursion you can copy and paste the code below. As you can see it's a simple Web Part with one property ProductId that contains the id of the product to be listed. A specific constructor has been added which takes an SPListItem as argument - this one is used later by the custom source to instantiate the Web Part. The CreateChildControls is very simple and just writes the name of the product and its price, if the product is found - otherwise it shows an error. Next is to create the Custom Web Part Gallery Source. First add a new Empty Element SPI to your project - the SPI will automatically be associated with the feature that was created by the Web Part SPI (unless you installed Waldeks fancy Visual Studio extensions :-). In that SPI add two new classes; ProductsWebPartGallerySource and ProductsWebPartGalleryItem. The first one is the actual custom source and the second class represents the items in that source. The required constructor required only passes on to its base class. The overridden GetItemsCore() method is the method that is responsible for returning all Web Parts discovered by this source. So in this case the method simply iterates over all available items in the Products list and creates a ProductsWebPartGalleryItem object. Also notice that I added the Guid attribute to the class - we'll need that later. The Instantiate() method is responsible for creating the Web Part with the correct properties and is called by the WebPartAdder and the custom source when a Web Part is added to the page. In this case we create the Web Part using the custom constructor and pass in the list item. As attribute values I use the Visual Studio replaceable tokens for the assembly full name and for the full name of the custom Web Part Gallery source class - here's the usefulness of the Guid attribute, no need to remember the class name and namespace and it allows for easier refactoring. Test the custom Web Part Gallery Source! The items in the Product list ends up as Web Parts in the Products category, with the sweet little icon. You can now choose a Web Part and insert into the page and see how it renders the correct information! You've now seen how you can extend the Web Part Gallery with custom Web Part Gallery Sources. It is fairly simple and it can be very useful if you want to help the users by creating pre-configured Web Parts. I can see really many good use cases of this. Oh, I forgot - this does not work in the Sandbox. Recent discussions I've been involved with and blog posts have highlighted some of the SharePoint 2010 Sandbox limitations (either as bugs or as a feature). I have also talked about this during SEF 2010 and SPCSEA 2010. While writing my book SharePoint 2010 Web Parts in Action I had the opportunity to discover these limitations early on and have learned to live with it. If you read my book you will find a lot of references to "this does not work in the Sandbox" (you've already ordered it huh? Otherwise it's just one click away). In this post I want to give you all a little head start on what really happens when executing SharePoint 2010 Sandboxed solutions. Focus is here on Web Parts. Before building solutions for the Sandbox you have to know how it actually works, that will also make you understand in more details why some things work and some don't. The User Code Worker Process recreates a HttpContext and the Page object. It then creates a Form, Web Part Manager and a Zone before it processes the page. I hope this little post helps you out understanding why some of the stuff you expect to work doesn't. This saves you some time when changing versions etc of the assembly. Visual Studio 2010 will now replace this during runtime with whatever you Web Part class name and namespace is, so you can feel safe renaming and refactoring. Even better is that this works for all other cases where you need to reference a type in an element manifest, user control or similar. Out-of-the-box the following file types will be parsed and parameters replaced; XML, webpart, DWP, ASCX and ASPX. For instance you might have added a event receiver for a content type - just add the same two tokens used in the sample above in the Assembly and Class elements of the Receiver element. The Tag Profile Page in SharePoint 2010 is used by the Managed Metadata Service (MMS) as a landing page for a term or a keyword. It is used to describe the tag, its location in the taxonomy, synonyms etc. It also contains all the latest tagged items and a note board. The page is quite dull out of the box. Fortunately this page is a Web Part Page and can be customized as you like! You can add Web Parts and rearrange the page. There is not much you can do with the Tag Profile Web Part, but you can edit the Tagged Items Web Part and change how many days it should go back to look for tagged items (default 60 days). The Get Connected Web Part can be slightly configured with what links it will show, see image to the right. And the Noteboard Web Part also has some configuration options such as how many notes to show etc. You could add some more out of the box Web Parts if you like but none of them integrates with the current term, not even through Web Part connections. Wouldn't it be awesome to connect the tag to an outside service like...let's say Bing News, and see if there are any related news to the tag? Just like below? The image shows the standard RSS Web Part in SharePoint 2010 which is configured to query Bing News for the current term. To achieve this I whipped together a small Provider Web Part that takes the term-id from the query string, looks up the value in the term store and then make that tag name available through an IWebPartField connection. This provider Web Part has one property which is used to set the name of the field. That field is then used by the RSS Web Part to create the query string to get the RSS feed. The provider Web Part is configured to be hidden on the page so that it is not seen by the users. This is a standard Web Part that exposes the IWebPartField interface (line 3) (which the RSS Web Part consumes). In the OnLoad (line 8) method the termid parameter is retrieved from the query string and this is used to lookup the name of the term using the TaxonomySession object (line 17) and stored in the local property socialTagName. The RenderContents (line 24) is used when in editing mode to display the status of the Web Part. The configurable property FilterName (line 32) is exposed so that the editor can change the name of the filter value that is sent to the consumer. For instance the Bing News RSS feed URL expects that the query parameter has the value "Query". The IWebPartField interface requires that the GetFieldValue and Schema methods are implemented. The GetFieldValue invokes the callback with the local property socialTagName and the Schema property returns a PropertyDescriptor of the type string and with the name equal to the FilterName property. Finally the provider connection end-point is configured. When the Web Part is deployed and feature activated on the My Site Site Collection you can edit the Tag Profile page and add the SocialTagInfoWebPart to the page. Configure it so that it is hidden and set the Filter name property to Query. Then add the RSS Web Part to the page. Configure the Web Part, give it a meaningful name like Related on Bing and set the RSS Feed URL to "http://api.bing.com/rss.aspx?Source=News&Market=en-US&Version=2.0". This is the URL that will be used to query Bing News. That is all needed to enlighten the Tag Profile Page. A little bit of coding can always sharpen up your SharePoint. If you would like to connect it to other RSS sources, just edit the URL in the RSS Web Part and the Filter name in the provider Web Part. I have recently been getting quite a few requests and comments about the status of ChartPart for SharePoint - a charting Web Part that I built about a year ago and shared on Codeplex. This latest version have had more than 6.000 downloads which I think is amazing, version 1 had close to 10.000 downloads. I temporarily put this project on hold a couple of months a go, due to two major reasons; the built-in Chart Web Part in SharePoint 2010 and that I'm currently writing a book (which essentially means that I have no time at all). Now we now that the out-of-the-box charting Web Part is SharePoint 2010 Server Enterprise only and I only have one and half chapters left on the book. So I aim to produce a new and improved ChartPart for SharePoint 2010 as soon as I return from my (well deserved IMHO) vacation. If you have any requests, ideas or rants about ChartPart for SharePoint then head on over to the Codeplex site and discuss or submit a feature request.